Lufthansa has made further concessions on December 13, 2017 in the course of the intended acquisition of parts of the Air Berlin Group. The transaction is currently being examined by the EU Commission as the responsible merger control authority. In the so-called Phase One assessment, Lufthansa had already offered extensive commitments in particular by giving up slots. However, the Commission considers this to be insufficient and has clearly indicated that an acquisition of Niki and its integration into the Eurowings Group would currently not be approved. Based on this assessment, a takeover of Niki by Eurowings is no longer being pursued. A share of the agreed purchase price for Niki has already been transferred to the company as bridge financing. The unpaid purchase price components will now be used for the organic capacity expansion in Niki’s markets. Economically, this leads to a comparable result for the Lufthansa Group. Copyright Photo: Niki Luftfahrt (flyNiki.com) Airbus A321-211 OE-LES (msn 3504) ZRH (Paul Bannwarth). Image: 934292. This entry was posted in Lufthansa, Niki and tagged Airbus A321-211, Lufthansa, msn 3504, Niki, Niki Luftfahrt (flyNiki.com), OE-LES, ZRH on December 13, 2017 by Bruce Drum. Lufthansa Group is planning to retire the Niki brand. Previously on October 13, 2017 Deutsche Lufthansa AG and the Air Berlin Group announced they had signed a contract regarding the purchase of NIKI Luftfahrt GmbH (Niki) and Luftfahrtgesellschaft Walter mbH (LGW). 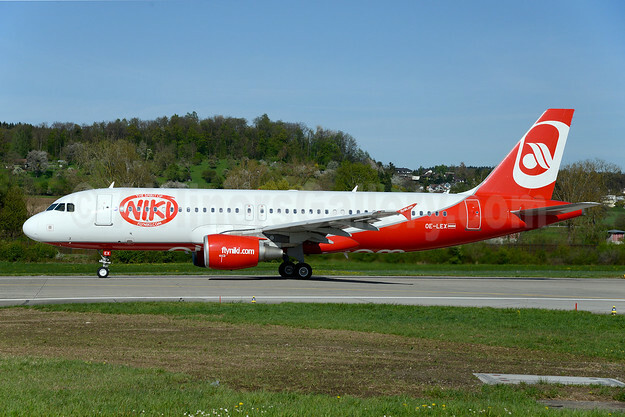 Niki with 830 employees, as well as 20 Airbus A320 type aircraft. According to Reuters, “Lufthansa plans to scrap the brand name of Austrian airline Niki as it integrates the carrier into its Eurowings budget business, a board member said on October 24, 2017”. 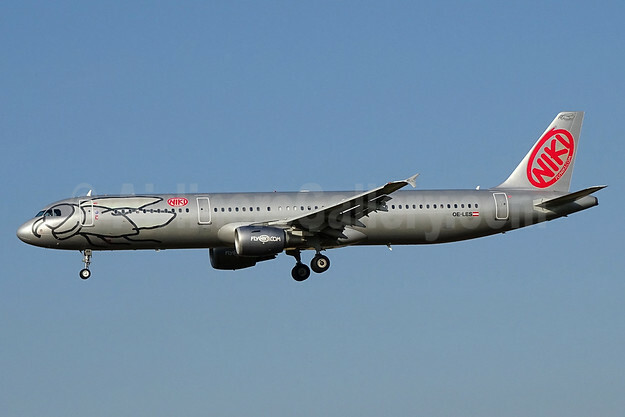 This entry was posted in Niki and tagged Airbus A321-211, msn 3504, Niki, Niki Luftfahrt (flyNiki.com), OE-LES, ZRH on October 25, 2017 by Bruce Drum. TUI AG‘s Supervisory Board has given the green light on November 23, 2016 for further steps with the goal to create a new European airline joint venture with Etihad Aviation Group. 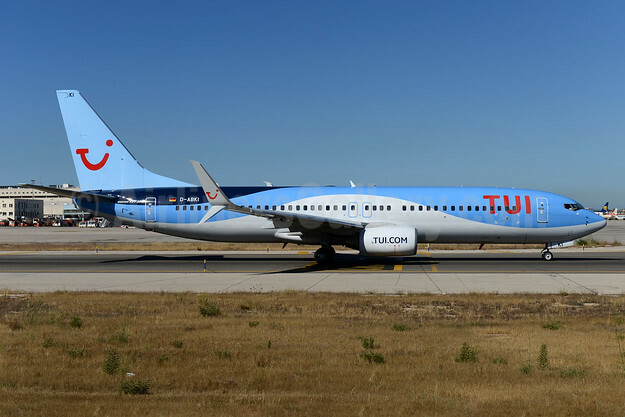 TUI Group’s supervisory body approved the plan to contribute its German leisure airline subsidiary TUI fly GmbH (TUIfly-TUI Airlines Germany) to a joint venture with Etihad. 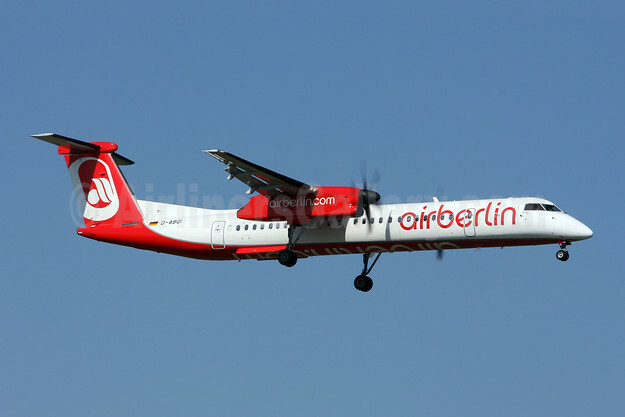 Etihad is in negotiations with Airberlin to acquire its touristic operations primarily in Southern Europe and North Africa, and including Airberlin’s participation in Niki, with the objective to contribute it to the joint venture. The contractual negotiations between all involved stakeholders are expected to be finalized in the next few weeks. Details regarding the future joint venture will be jointly presented by Etihad and TUI after successful completion of the negotiations. In the summer of 2007, Hapag-Lloyd Express (HLX) and Hapagfly merged to form TUIfly. The airline is a wholly-owned enterprise of the TUI Group, the world’s leading tourism troup with headquarters in Hanover, Germany. TUIfly flies to the classic holiday regions all around the Mediterranean, the Canary and Cape Verde Islands, Madeira and Egypt for TUI and other tour operators. By the summer of 2014, TUIfly used 40 Boeing 737 aircraft to fly to these destinations. TUIfly headquarters are at the Hanover Airport. Top Copyright Photo: TUI Airlines (Germany) Boeing 737-86J SSWL D-ABKI (msn 37748) PMI (Ton Jochems). Image: 933944. Bottom Copyright Photo: Niki Luftfahrt (flyNiki.com) Airbus A320-214 OE-LEF (msn 4368) ZRH (Rolf Wallner). Image: 927323. This entry was posted in Airberlin, Etihad Airways, Etihad Airways Partners, Niki, TUI Airlines (Germany), TUI Group, TUIfly and tagged Airberlin, Airbus A320-214, Boeing 737-86J SSWL, D-ABKI, Etihad Airways, msn 37748, msn 4368, Niki, Niki Luftfahrt (flyNiki.com), OE-LEF, TUI Airlines (Germany), TUI Group on November 26, 2016 by Bruce Drum. Niki (flyniki.com) (Vienna) will add the Vienna-Athens route on April 1. The new route will operate daily (except on Saturdays) with Airbus A320s. Niki flight (HG 8640) will take off from Vienna at 11:30 and land in the Greek capital at 13:35. The return flight (HG 8641) will leave Athens at 14:25 and land in Vienna at 16:45. Copyright Photo: Paul Bannwarth/AirlinersGallery.com. Airbus A320-214 OE-LEH (msn 4594) completes its final approach to the runway at Tenerife Sur. This entry was posted in Niki and tagged 4594, A320, A320-200, A320-214, Airbus, Airbus A320, Airbus A320-200, Athens, flyNiki.com, Niki, OE-LEH, Tenerife, Tenerife South, Tenerife Sur, Vienna, Vienna-Athens on March 14, 2015 by Bruce Drum. 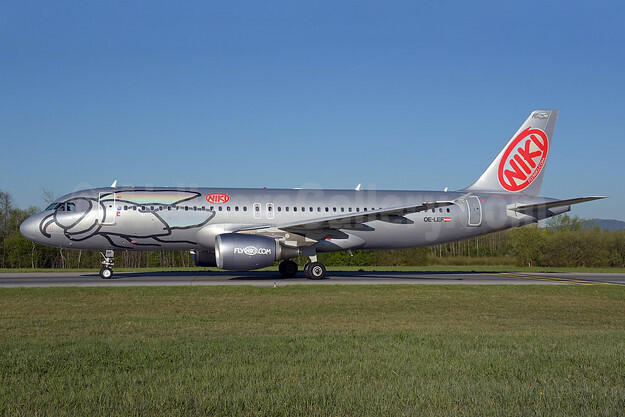 Niki (FlyNiki) (Vienna) will introduce on April 1 one of world’s shortest jet routes, the 30-mile trip between its Vienna hub and Bratislava, Slovakia. The short route will be operated with Embraer 190s. Niki is also adding service (six days a week) from Vienna to Athens in April. Niki already serves Crete, Rhodes, Santorini and Mykonos. The new route will operate daily (except on Saturday) with an Airbus A320. Niki flight HG 8640 will take off from Vienna at 11:30 and land in the Greek capital at 13:35. The return flight HG 8641 will leave Athens at 14:25 and land in Vienna at 16:45. Copyright Photo: Paul Bannwarth/AirlinersGallery.com. Embraer ERJ 190-100LR OE-IXC (msn 19000349) arrives in Zurich. This entry was posted in Niki and tagged 19000349, Athens, bratislava, Embraer, Embraer 190, Embraer ERJ 190, Embraer ERJ 190-100, ERJ 190, ERJ 190-100, ERJ 190-100LR, Niki, OE-IXC, Vienna, ZRH, Zurich on January 9, 2015 by Bruce Drum. 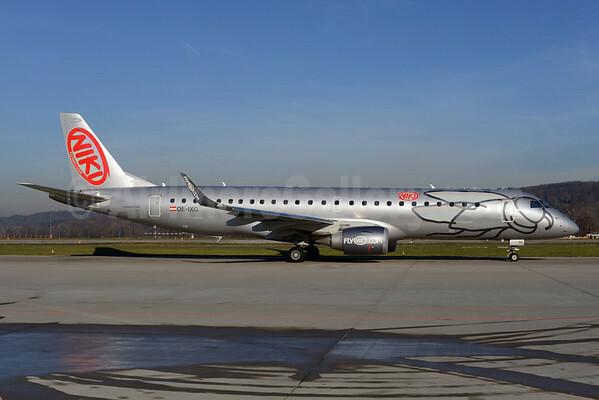 Helvetic Airways (Zurich) is planning to lease the seven 112-seat Niki (flyniki.com) (Vienna) Embrear ERJ 190-100LRs from lessor Bernina Aircraft Leasing which acquired the aircraft according to ch-aviation. This will be a new type for the carrier. The first four will be operated by Helvetic for Swiss replacing four Swiss European Air Lines RJ100s. The other three will be operated by Helvetic on expansion routes. Zurich to Dusseldorf, Prague and Warsaw starting on December 22. Zurich to Belgrade starting on January 3, 2015 per Airline Route. 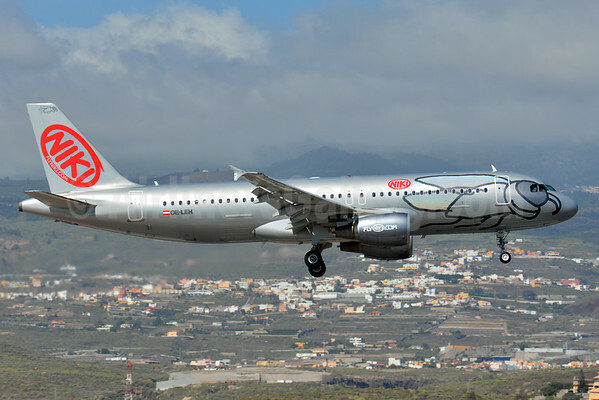 Niki is retiring the Embraer 190 from its fleet. In other related news, the company has announced new services next summer season to Olbia (from Bern), Brindisi (from Bern), Bordeaux (from Zurich), Calvi (from Zurich), Lamezia Terme (from Zurich), Shannon (from Zurich), Palma de Mallorca (from Bern/Zurich), Greek Islands (from Bern/Zurich) and the Canary Islands (from Zurich). Copyright Photo: Rolf Wallner/AirlinersGallery.com. 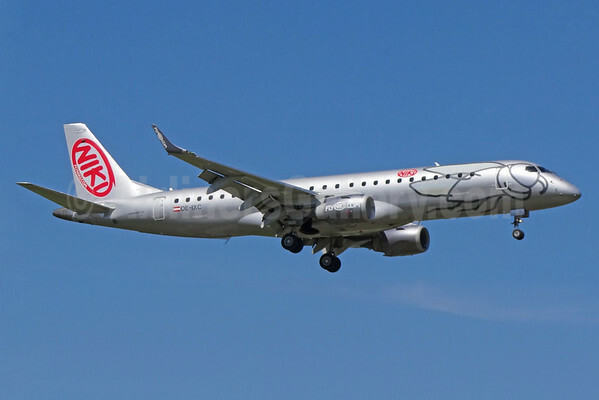 Embraer ERJ 190-100LR OE-IXG (msn 19000435) at Zurich will soon transition to Zurich-based Helvetic Airways. This entry was posted in Helvetic Airways, Niki and tagged 19000294, E190, Embraer, Embraer 190, Embraer ERJ 190, ERJ 190, ERJ 190-100, ERJ 190-100LR, Helvetic Airways, Niki, OE-IXG, ZRH, Zurich on December 7, 2014 by Bruce Drum.